State Sen. Carlos Uresti, on right, and his wife Lleanna Uresti leave arm in arm from the downtown federal courthouse on Monday. Uresti; Gary Cain, a former consultant for Four Winds; and former Four Winds CEO Stan Bates face, collectively, 22 counts — 11 of which belong to Uresti. In August 2010, Denise Cantu – the prosecution’s main witness – was in a car accident, which killed two of her four children. Cantu hired Uresti as her lawyer, and In October 2012, she received over $1 million in the settlement. By 2013, Uresti began asking Cantu to invest some the settlement money, including two loans of $25,000 and $75,000. In January 2014, Blackwell said Uresti was introduced to Bates and agreed to be an investment broker to bring people into Four Winds. He said Uresti convinced several investors to invest in Four Winds, including Cantu, who provided $800,000 of her settlement money. The government said a relationship between Uresti and Cantu began as a friendship but turned sexual. Blackwell said Cantu would trust Uresti as a confidant. A group of Mexican investors also bought in, alongside Richard Thum, the owner of the San Antonio-based Five Star Cleaners. Blackwell said Bates misused money and little went to buying and selling fracturing sand. Bates, along with other Four Winds employees, pleaded guilty to fraud earlier this month. Uresti’s attorney Michael McCrum told jurors there was fraud but Uresti was not involved. “You’re going to hear how Stan Bates and a few employees … in the secrecy of those private computers misused those people’s money. People pled guilty to fraud. Fraud did happen. People on the outside didn’t know about it,” he said, adding Uresti did not have access to Four Winds books or accounting software. McCrum said much of the correspondence after providing the $800,000 was between Cantu and Bates in text messages and not Uresti. He said Bates and Cantu also had a sexual relationship. According to prosecutors, Uresti received $115,000 from Four Winds over seven and a half months through multiple means, including legal fees and monthly retainer fees. Stan Bates received $633,000 over 13 months, and Cain received $210,000 over seven months. Sixteen jurors were selected — six men and ten women — and four will serve as alternates. No witnesses testified Monday due to technical issues with the court room’s audio and video system. Judge David Ezra dismissed the jury and court will reconvene Tuesday. State Senator Carlos Uresti says he’s innocent of fraud, bribery and money laundering charges that could bring him a 200-year prison sentence if convicted on all charges. The San Antonio Democrat appeared before a federal judge this morning. State Senator Carlos Uresti, a Democrat representing parts of San Antonio, is facing two indictments that were handed up by a federal grand jury on Tuesday. The federal government claims Uresti was participating in a Ponzi scheme., a type of fraud in which investors are recruited for a nonexistent business by the payment of quick returns to early investors from money paid by later investors. 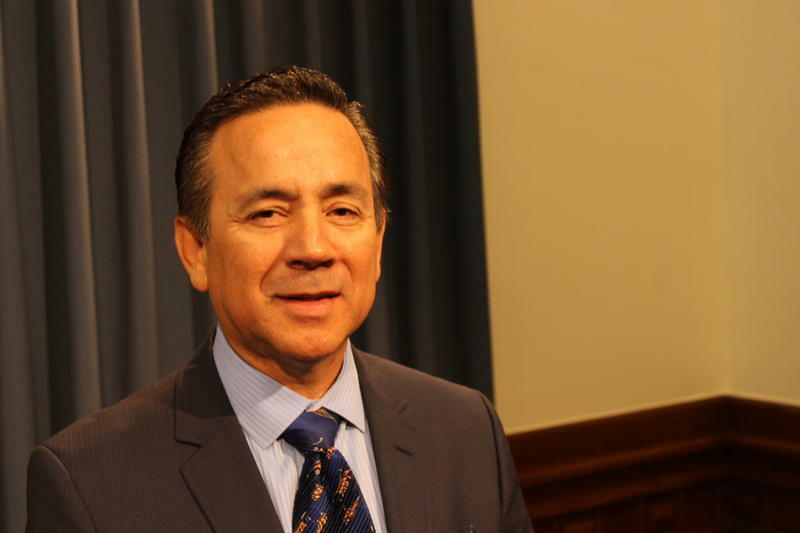 In a statement Sen. Carlos Uresti said he was spending Thursday at the state legislature doing the people’s work. But he was nowhere to be found. State Rep. Tomas Uresti was there and defended his younger brother.